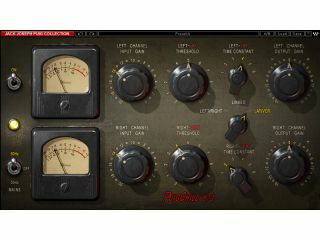 The PuigChild 670 emulates a classic Fairchild compressor. Having previously designed a collection of presets for the company, producer/engineer Jack Joseph Puig has now endorsed a complete Waves plug-in collection. This features three processors: the PuigChild 660 & 670 compressor/limiter, the PuigTec EQP-1A program equalizer and the PuigTec MEQ-5 mid-range equalizer. Each plug-in is a software version of a vintage hardware box that Puig uses to create his sound. The PuigChild 660 & 670 takes its lead from the Fairchild 670 compressor, which was a must-have for any serious producer back in the day. The PuigTec EQP-1A, meanwhile, emulates the Pultec EQP-1A, and can pull the clever trick of boosting and cutting the same frequencies simultaneously, thus creating a resonant shelf. Finally, there's the PuigTec MEQ-5 - this emulates another Pultec processor, the MEQ-5. All the plug-ins look suitably 'vintage', and if Waves' track record is anything to go by, they'll deliver a classic sound, too. The Jack Joseph Puig Collection is available now in native (RTAS, VST and AU) and TDM formats for Mac and PC. The former bundle costs $800 and the latter $1600. Detailed spec information is available at the Waves website, where you can also download a demo.